As you all know, life is rough. As you all also know, I often like to complain about how rough life is. I’m not going to bore you because I’ll seem redundant, and these days if you’d like a refresher on something I’ve said in the past, all you have to do is type some words into the search bar and find your prize. Alls I’ve got to say is that sometimes being an adult is no picnic. Every now and then it’s a ten-course meal at a five-star restaurant. But sometimes it’s just a bowl of cereal from that box of Cheerios you’ve had in your pantry forever. Now, let’s be real. Last week was tough on me. In addition to dealing with life’s everyday stresses, I found myself coping with some rather unfriendly behavior from people I believed were in my corner. It was pretty heartbreaking, especially since it involved hurting not only me, but people I deeply love. 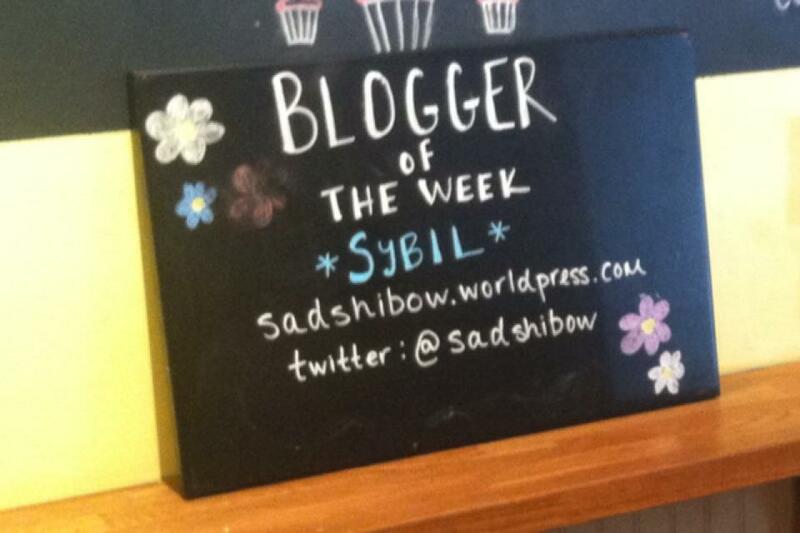 And no one messes with the loves of Sad Shibow. Sylvapotamus brought to my attention that this says “worldpress.” What the hell, I say, I’ll take it! Me! You guys, they picked me! Now, this may seem small to a lot of people, and hey, it is sort of small in the grand scheme of things. But to me, it’s huge, and not only because this place has the BEST cupcakes I have ever allowed into my belly. So, what’s the big deal? 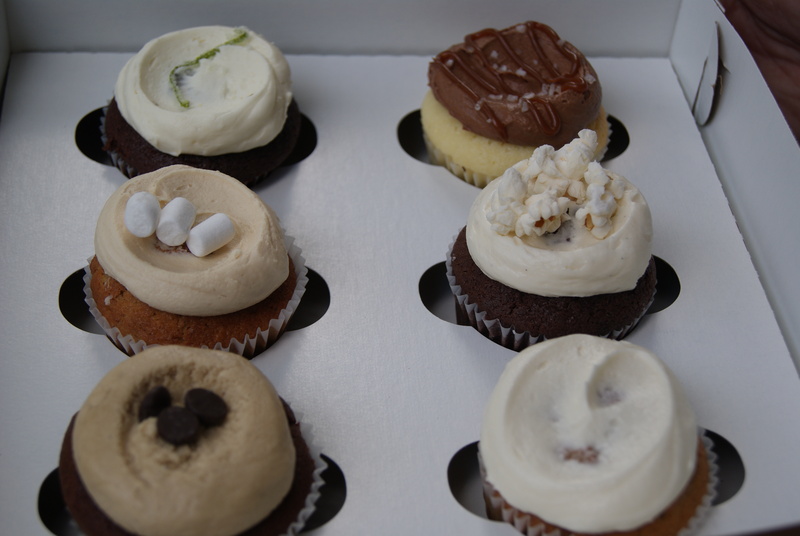 Half of the dozen cupcakes we picked up this weekend. You can’t still be wondering why I love this place so. About a year and a half ago, around my 24th birthday, I was in a not-so-great place, for many many reasons. I was so down that I’d lost the desire to do pretty much anything I enjoyed, including bake. 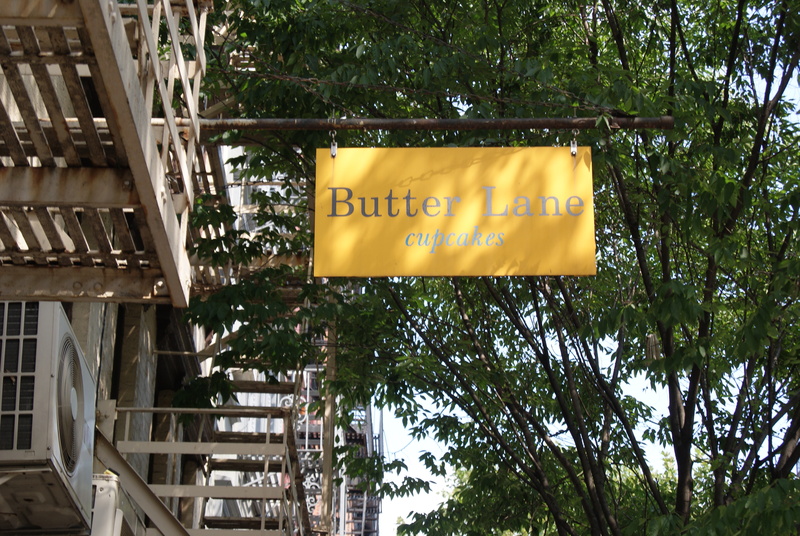 I happened to see something somewhere on the great many internets about cupcake classes at Butter Lane, and decided to woman up and book a class. It was so entertaining and enlightening that it made me finally want to get back into my own kitchen. When my boyfriend recently asked me why I loved the place so much, I told him that it basically made me grateful for things again. So…thank you, BL. DEEP THOUGHTS! Ok, onto the make-stuff portion. Originally I was going to tell you all about the delicious, easy-peasy cookie dough ice pops I made. 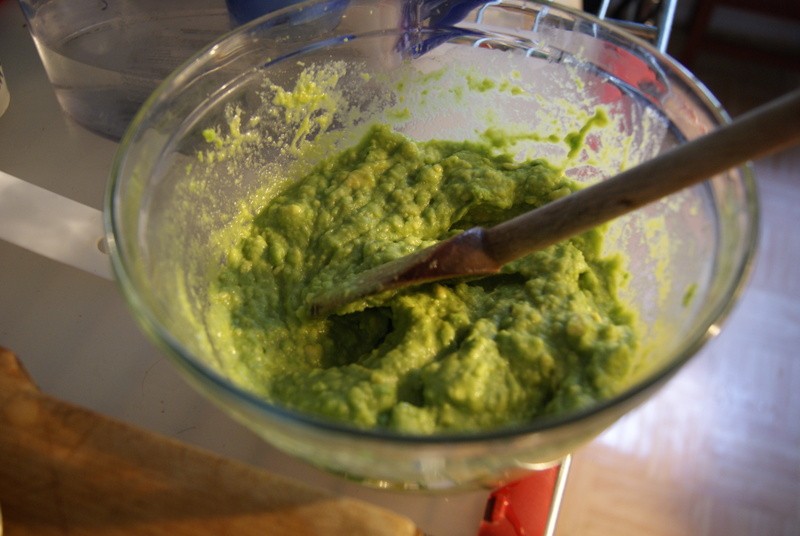 While they were, indeed, pretty simple to make, I found them to be kind of gross. This is not the fault of the author of this recipe at all. It is, instead, my bad, for believing that skim milk could, and should, always take the place of whole milk. In life, I’ll usually try to take the healthier route when it comes to my eating habits (I say “in life” expecting you all to pretty much ignore every buttery post on here for a hot second). I do the whole wheat bread instead of white thing, the no-soda thing, boringboringblah you get it. I’ve even convinced myself that I enjoyed frozen yogurt much more than I enjoyed ice cream. And while I do like to get my Yogo on every now and then, I recently discovered that I was, to put it as eloquently as possible, trippin’. Ice cream > fro-yo. Who knows what else I’ve brainwashed myself into believing was right. Wait… so just to check… is steak any good? Anyway, we’re dealing with another odorous NYC heat wave. Everyone smells like the aquarium (Why doesn’t anyone know what that smells like?!) and I’m super cranky all the time, so obviously you best believe I’m not going near the oven. Oh, and, we did kind of just buy and eat a dozen cupcakes over here, so we need something a teensy bit light. 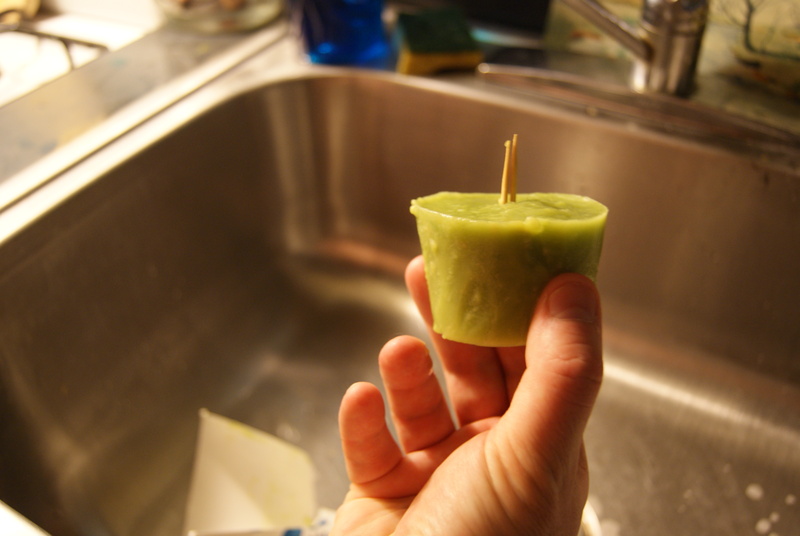 Let’s make avocado pops! Weird enough for you? In case they’re not, check these out! Now, ya’ll know I’ve been meaning to make these forever, but I guess it got cold again before I could. So…yeah. Let’s just do this. I used paper Dixie cups, FYI. Combine the water and sugar in a small saucepan over medium-high heat, stirring until the sugar dissolves. Let cool to room temperature. This is known as simple syrup, and can also be used for your boozy mixed drink of choice, should you be 21+ and need such information. 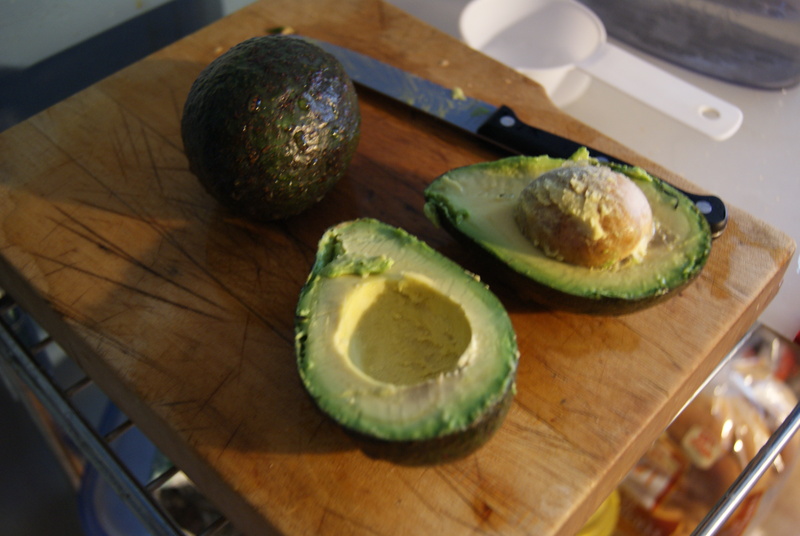 Meanwhile, peel and pit your two avocados, and mash the flesh in a medium-sized bowl until smooth. Add in salt and lime juice, then stir in your simple syrup. You can use a blender or mixer if you’re feeling lazy ;). Pour into your molds and send into the freezer for at least 5 hours. I filled my Dixie cups about halfway, and ended up with five pops. The night we first tasted these was an excellent night. There was champagne, an even split of the last Butter Lane cupcake, and a viewing of Blues Brothers (I’d never seen it! It was so awesome!). So, how’d these pops do? Yes, those are toothpicks, which are actually useless. Do better than Shibow did, kids. Do better. I loooooooved these things. LOVED them. They’re creamy, tangy, sweet and unbelievably refreshing. I’m sad I only ended up with five, but happy they are super easy, because these are being made again ASAP. ← No Good Deed Goes Unpunished. Most Good Deeds Are Very Awkward. Let’s Make Muffins. Jimmy, you are one lucky man! You get to be trying all these sweet treats. I hope I can get in on the tastings once I get back.